28 posts categorized "Oorah Kars4Kids"
The report is a bit unclear, but what Oorah/Joy For Our Youth/Kars-4-Kids did (and still does to some extent) is portray their organizations – all controlled by the people who control Oorah – as helping all needy kids, when in reality almost all of the money goes to Oorah – a haredi missionary outreach organization whose aim is to put non-Orthodox Jewish kids in haredi yeshiva schools. 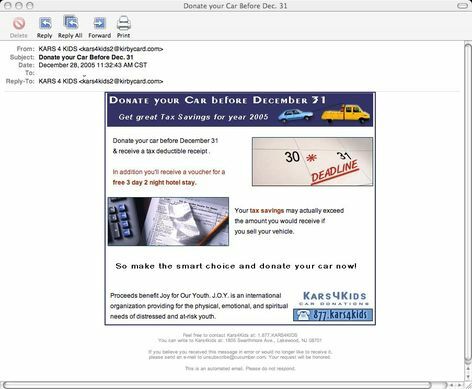 Kars-4-Kids hides this from the public, uses deceptively designed commericals, and practices what many – including at least two state attorneys general – say is illegal bait-and-switch advertising practices to get donations. Stephen Schwartz is suing a number of entities all run by the same Lakewood-based management office where, according to the lawsuit, he was hired under a two-year contract to serve as an attorney. The named defendants in the suit, filed Monday in state Superior Court in Paterson, are Oorah Inc., Kars 4 Kids and J.O.Y. For Our Youth. Schwartz was allegedly fired because he had to do reserve duty with the National Guard. Oorah, the Lakewood, New Jersey-based haredi kiruv ('outreach,' missionary) organization that specializes in convincing non-Orthodox Jewish families to kids to enroll their kids in haredi yeshivas and day schools, made what was supposed to be a humorous fundraising video that features a haredi comedian, Shlomo HaDarshan, in blackface playing controversial civil rights activist and MSNBC host Rev. Al Sharpton. But the video has now been marked private on YouTube, even as a picture of the Sharpton blackface character still appears on Oorah's website. Kars4Kids and Oorah Inc., an affiliated not-for-profit organization, lost $5.25 million – nearly as much speculating on real estate in 2010 as they spent on programming. Oorah, the operation’s program arm, spent only $6.3 million of the $29 million collected by Kars4Kids on program expenses in 2010, despite the fact that the organizations hold a combined $39 million in assets. A federal court has found that Oorah failed to pay hundreds of thousands of dollars of tuition scholarship money it owed to the Jewish Foundation School/Rabbi Jacob Joseph Orthodox day school. The trial portion of the Jewish Foundation School/Rabbi Joseph Jacob Orthodox day school's federal lawsuit against haredi kiruv organization Oorah is ended today in Brooklyn with a victory for RJJ. RJJ – which previously won a beit din decision that Oorah ignored – sued Oorah for almost $400,000 in back tuition the beit din ruled Oorah owes for non-Orthodox students it entolled in RJJ by promising students' families free tuition. Kars4Kids, the haredi car donation program that is controlled by the leadership of and funds Oorah, announced yesterday that they will be hosting their 2nd annual coat giveaway in Newark, New Jersey next week. The event was planned in conjunction with Mayor Cory Booker’s office, and the mayor is expected to attend the event. Low wage workers brought from Lakewood, New Jersey to Oorah's camp in upsate New York in 2010 to renovate the camp were not paid for their labor. Oorah claimed a subcontractor was responsible for the wages. But Oorah also owed that subcontractor a large amount of money. Haredi missionary organization under investigation for not paying workers hired to remodel its boys camp. Oorah claims a subcontractor is the true employer but it also admits it owes that subcontractor money. Non-Jewish workers shorted weeks of pay. Haredi outreach organization Oorah claims contactors owe workers the money, but Oorah also admits to owing those contactors at least $30,000. Cuomo subpoenaed 16 organizations and individuals, including Kars 4 Kids (Oorah), Lechaim for Life, and Cars that Help. Haredi kiruv organization and its bogus subsidiary for 'at risk' youth are again linked to shady dealings. Money went in and money came out – laundered. A rotting carcass was found Saturday, along with skeletal remains and live, neglected animals. Government officials had to bring in food and water for the animals. And what is located next to this illegal zoo of horrors? You buy a retirement home across the street from a camp. For 10 years, everything is fine, no problems. Then the camp is sold to Orthodox Jews. Now even neighbors one mile away from the camp complain about noise and huge banks of bright lights on all night, with loudspeakers blaring at 3 AM. Who owns and runs the Orthodox camp? The New York Post has a report on car donation charities active in New York City. Of those most active, only two met minimum standards set by the Better Business Bureau. Of those two, one deceives donors into believing their donation helps all children when in fact the money goes only to haredi evangelism. Another charity fails both the BBB minimum standards test and the deception test. It claims to be helping blind people but really prints haredi religious material for the visually impaired. The deceptive children's charity, Kars-4-Kids, which presents itself as nonsectarian, claims it helps "children who were on the streets." Yet the money it raises goes to Oorah, a linked organization that, according to the NY Post, claims an "80% success rate" at keeping the children it helps away from goyyim. A handful of Brooklyn-based charities are concerned more about their own bottom line than they are about those who may have hit rock bottom, according to an independent charity evaluating organization. The group, Charity Navigator, recently released ratings for some 5,000 large charities nationwide. Thirty-eight Brooklyn charities made the list, which assigns efficiency ratings from four stars, awarded to the most efficient, to zero stars, to those performing far below industry standards. The stated goal of Zichron Shlome Refuah Fund, located at 1319 51st Street, is to help children and adults stricken with cancer. According to Charity Navigator, which uses publicly available information to make its determinations, Zichron Shlome had a total revenue of $976,600 in fiscal year ending December 2005. Meanwhile, it spent $338,667 on program services, and nearly equal that on its own administrative expenses, $311,979. The group’s fundraising expenses totaled $359,003. That same year, Heritage for the Blind, 2071 Flatbush Avenue, had a total revenue of $2,400,386 and spent $495,133 on program expenses, close to $1 million on administrative costs and $1.8 million on fundraising, according to Charity Navigator. “Heritage for the Blind spent 15 percent of its budget on its programs. Most [charities] spend 75 percent or more,” Miniutti noted. Of its $1,506,879 in total revenue for the fiscal year ending March 2006, the National Children’s Leukemia Foundation, 7316 Avenue U, spent $153,166 on program expenses, $153,320 on administration, and close to $1.2 million on fundraising, according to the website. Yad L’Achim Peyle Israel, 172 1/2 Lee Avenue, whose mission is to promote Orthodox Jewish observances, listed a total revenue of $985,181 for the fiscal year ending October 2005. Of that, it used $539,243 on programs, $126,764 on expenses and $271,846 on fundraising. I would note that, of the three haredi 4 star charities, one, the Mesorah Heritage Foundation, is a sister company of ArtScroll. I wonder how good Mesorah would look if ArtScroll's books were open for inspection, side by side? Perhaps a star or two would be removed? The first column is money paid by the Mesorah Heritage Foundation, the second is money paid by ArtScroll and other affiliated companies. The third bolded column is the total amount paid to each. The Mesorah Heritage Foundation has quite a bankroll, as well – it has net assets of $6,181,266. It also may be that ArtScroll uses the Mesorah Heritage Foundation to pay much of its help – translators, graphic artists and the like – which Mesorah counts as progaraming expenses. I wonder if ArtScroll would open its books to scrutiny? On the other hand, Ezer Mizion has a sterling reputation, and deserves your support. Related haredi charity malfeasance can be seen here. Rabbi Gil Student notes that he refused to run an ad for Sam Harris's new atheist book, and that refusal made yesterday's Wall Street Journal as part of an article on the book's promotion. Harris is a strong spokesman for atheism, and his arguments directed against Christianity also work very well against another religion – Orthodox Judaism – so it's no surprise Student – who regularly bans comments and commenters who challenge Orthodoxy – would ban Harris, as well. This week, I also turned down an ad, not for Harris's book, but for Oorah, the haredi missionary* organization. I did so because of Oorah's questionable fundraising tactics. (Please scroll down to the bottom of the linked page and read upward. This post will be at the top, above the other Oorah posts.) Perhaps that will get media attention one day, although I doubt it. * I label Oorah missionary because it targets children below the legal age of consent. Proceeds benefit Joy for Our Youth. J.O.Y. is an international organization providing for the physical, emotional, and spiritual needs of distressed and at-risk youth. Again, J.O.Y. gifts all of its money to Oorah. Oorah is a sectarian missionary organization whose sole declared purpose according to it's IRS filings is "kiruv," Jewish religious outreach, and related educational scholarships to Orthodox Jewish Schools. And Oorah gives less than 38% of its income to those causes and shows extremely high expenses. Cucumber Communications is one long distance provider that makes it easy for busy people to support causes they care about. Cucumber Communications is a division of Oorah inc.
ALL our profits [this appears to be false – see here] are directed to non-profit groups working for human rights and children’s education. Through our long distance services, customers can generate progressive donations for non-profit groups just by doing what they do every day – best of all, it costs you the customer not a penny more. With Cucumber, every call you make builds a better world. Oorah is endorsed by almost every leading rabbi in the Orthodox world. In most states, this is criminal fraud, and it certainly violates IRS rules. Will Oorah lose its IRS 501 (c) (3) status? Will Oorah's board be prosecuted? Only time will tell. Oorah, the Lakewood-based haredi missionary organization whose deceptive advertising practices were exposed by the Saint Louis Post Dispatch, distributes less than 38%*** of its income to the childrens programs it champions. According to the most recent IRS 990 filing available (Download oorah_2003_irs_990.pdf) , Oorah had gross revenues of almost $2,000,000 yet used only $741,639 of that revenue for outreach and for underwriting Jewish education. Almost $741,000 went to cover expenses and another $482,000 was held as "assests" and not disbursed. Oorah's for-profit subsidiary, Cucumber Communications, is shown with a total income of $208,609. Even though Oorah claims that "every penny of profit" is given to Oorah, Ooorah's IRS filing shows that Cucumber transferred only $144,391 to Oorah. Cucumber also shows assets of $367,301. Oorah is run by Rabbi Eliyohu Mintz. "1-877-KARS4KIDS. . . K-A-R-S, cars for kids . . . 1-877-KARS4KIDS. . . Donate your car today." The advertising spots, which have been airing on KMOX since before Thanksgiving, offer few details on the vehicle donation program. They tell listeners the program is a "recognized charity" and donors will receive a "maximum deduction" from the Internal Revenue Service for their vehicles. The ad also says donors will receive a "free vacation voucher" good for a three-day, two-night stay. What is left unsaid, and what also is conspicuously absent from the charity's Web site, is that almost all money raised through the Kars4Kids charity goes to a Lakewood, N. J.-based program set up to pay for private schooling and other educational programs. It aims to bring Jewish schoolchildren and adults closer to their heritage. A 2004 report from the Better Business Bureau's national office, the most recent available, is tough on the Kars4Kids and related JOY For Our Youth program. The report says the charity may not meet at least eight of the BBB's 20 standards for charity accountability. The group's board of directors does not provide adequate oversight of the charity's organization and staff. The group has declined to make public annual financial statements or annual reports. The group does not have a board-approved budget. Despite requests, the charity has not provided the BBB with fundraising and informational materials about its programs. A BBB official says 70 percent of the national charities it has scrutinized meet all of its accountability standards. Officials with Kars4Kids and JOY For Our Youth did not responded to several Post-Dispatch requests for information about either its advertising campaign or its programs. The radio advertising spots refer listeners to the group's Web site at Kars4Kids.com. As of Tuesday, the site said car donations benefit JOY for Our Youth, which it describes as "an international organization providing for the physical, emotional and spiritual needs of distressed and at-risk youth." The site also says that JOY was established in 1996 "to help those children who were on the streets with no one to turn to for help. JOY stepped in to fulfill a need for children who had nowhere to go and no one to turn to for help." None of the Web site information indicates that Kars4Kids or JOY have any ties to a specific religious group, but federal tax records paint a different picture. JOY's 2003 tax filing with the IRS - the most recent available - reports that its only only grant that year, for $207,000, was made to a nonprofit group called Oorah Inc. Tax records for both JOY and Oorah list the same New Jersey address. While phone calls placed to Oorah also were not returned, that group's Web site says it was founded in 1980, "with the goal of awakening Jewish children and their families to their heritage. "We seek out families who are interested in enriching their spiritual lives and provide them with the right resources to succeed." The site also says Oorah enables children to enroll in Jewish day schools or yeshivas and brings "adult education opportunities to the parent, as well as all the ritual objects and support they need to live a full Jewish life." A January 2005 story in New York's The Jewish Week said Oorah recruits potential students by going "door-to-door" in search of unobservant Jewish families receptive to the idea of sending their children to day school. The article quotes Oorah's head, Eli Mintz, as saying: "I think it's the right of every Jewish child to know his tradition. And for him to really know his roots and who he is, not to intermarry, to keep his Jewish identity, without a yeshiva education, he doesn't have a clue." The story says Mintz takes no salary but added that "he does not explain the source of his income." Bennett Weiner, chief operating officer with the Better Business Bureau's Wise Giving Alliance, said federal tax rules on car donations were tightened beginning with this year. Prior to this year, most donors could claim a tax deduction in the amount of the fair market value of the donated vehicle. Now, if the charity or its agent resells a donated car, the donor in most cases is able to take a deduction only for the amount of the car sale. Weiner also said car donations have become increasingly popular among charities, which usually negotiate with third-party brokers to pick up and sell the cars for them. Weiner urged that vehicle owners research a charity's programs, finances and governance before making a donation. He did not criticize the Kars4Kids program, saying the BBB reports serve only as a guide to help prospective donors decide whether they should give to a specific charity. JOY is a registered international, 501(c)(3), non-profit organization providing developmental programs for at risk youth. JOY provides food, clothing, shelter, health and wellness, education, after school programs, special training, mentoring, tutoring, private counseling, summer programs, and guidance to children from the ages of six to eighteen. Established in 1996 to help those children who were on the streets with no one to turn to for help. The dire situation of many young children was at dangerous levels. JOY stepped in to fulfill a need for children who had no where to go and no one to turn to for help. JOY has blossomed into an international organization helping to alleviate the problems of hundreds of children, and finding solutions that work. Oorah, which means "Awaken," was founded in 1980 with the goal of awakening Jewish children and their families to their heritage. We seek out families who are interested in enriching their spiritual lives, and provide them with the right resources to succeed. We enable children to enroll in Jewish day schools or yeshivos, where they receive a full religious and secular education straight through high school. While the children learn and grow, we bring adult education opportunities to the parents, as well as all the ritual objects and support they need to live a full Jewish life. Oorah has the endorsements (Download oorah_rabbinic_endorsements.pdf) of many haredi gedolim and rabbinic leaders, including many who sigined the Rabbi Slifkin Ban, and a who's who of Modern Orthodox leaders as well, including YU's Rabbi Modechai Willig, the OU and YU's Rabbi Menachem Genak, and the Beit Din of America's Rabbi Michael Broyde. Also note that Kars-For-Kids and Joy For Our Youth have apparently stolen the trademarked Dummies symbol from the Dummies Guides series and used it for a "Dummies Guide To Car Donations" and for a "Dummies Guide To In Kind Donations" on their respective websites. UPDATE #1: Steven I. Weiss notes that the Kars4Kids website is registered to Rabbi Eliyohu Mintz, who also heads up Oorah. Oorah's president is Rabbi Chaim Mintz, a senior official at the Yeshiva of Staten Island. Oorah owns Cucumber Communications, and claims that "every penny" of profit goes to Oorah's activities. UPDATE #2: Kars4Kids Chicago-area car seller is a convicted felon who has previously defrauded the charities he represents.